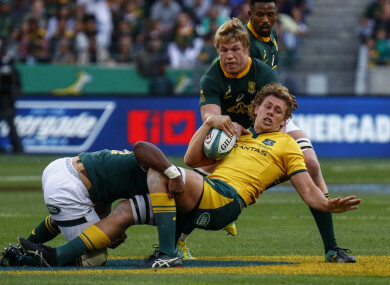 Ned Hanigan is tackled by Pieter-Steph du Toit in Port Elizabeth. SOUTH AFRICA WITHSTOOD fierce second-half pressure from struggling Australia to win 23-12 Saturday in a tense, scrappy Rugby Championship fifth-round match in Port Elizabeth. Victory for the Springboks, who led 20-12 at half-time, moved them within two points of leaders New Zealand, who play Argentina in Buenos later Saturday. Australia suffered a sixth loss in eight Tests this year, adding to the pressure on coach Michael Cheika amid reports that former star George Gregan may join the staff. Both teams scored two tries and it was goal kicking that proved the difference with the Springboks converting all five shots at goal and the Wallabies only one of four. There was little to choose between the teams during an error-strewn match in which Australia exerted a lot of line-out pressure on South Africa. The Springboks needed just 23 seconds to take the lead as Aphiwe Dyantyi intercepted a skip pass from Kurtley Beale and scored a try that Handre Pollard converted. Matt Toomua missed a long-range penalty for Australia in an electric atmosphere with spectators standing, singing and dancing in the stands. South Africa responded to the support of a near-capacity crowd in the 45,000-seat stadium by doubling their lead to 14 points on 22 minutes. Pollard evaded two would-be tacklers to send fellow half-back Faf de Klerk over and the fly-half converted from in front of the posts. Australia were encouraged by several turn-overs from master ball-stealer David Pocock and silenced the crowd by crossing the tryline twice within three minutes. A perfectly weighted skip pass from Will Genia allowed Reece Hodge to dot down in the corner, but Toomua could not convert. The second Wallabies try came in the other corner with Marika Koroibete breaking and his pass sent Genia clear to score. Toomua succeeded with his second conversion, leaving only two points between the teams 30 minutes into the opening half. South Africa finished the half stronger and Pollard slotted penalties either side of a missed shot at goal by Hodge to give the home team a 20-12 half-time advantage. After 32 points in the first half, the second half produced just three, a 46th-minute penalty by Pollard, who finished with a five-from-five goal-kicking record. Australia will wonder how they failed to score after the break as they were camped inside the South African 22 for 10 minutes only to be repeatedly thwarted by brave defending. South Africa were temporarily reduced to 14 men on 65 minutes when French referee Jerome Garces lost his patience after a string of penalties and sin-binned Dyantyi. But the Springboks survived the numerical setback to maintain an unbeaten record at the Port Elizabeth stadium with five victories and a draw. Email “Springboks withstand fierce second-half pressure to defeat Australia in Port Elizabeth”. Feedback on “Springboks withstand fierce second-half pressure to defeat Australia in Port Elizabeth”.